This owl is so sweet! I really love her pink hat and scarf. I used some crystal effects on her to add some shine on her candy cane and her beak. Now for the real fun!!! 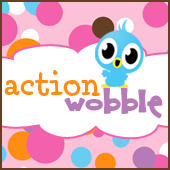 She's on an action wobble!! Woo hoo right? This fold is so fun, simple yet a nice wow factor!